The club operates its Marina facilities under Licences from the Ministry of Defence who own the land and waterfront and the Marina is shared with the Joint Services Adventurous Sail Training Centre (JSASTC). The Marina has approximately 230 berths for sailing yachts up to 40 feet LOA. Yachts are generally double berthed alongside pontoons which have fresh water and electricity supply. 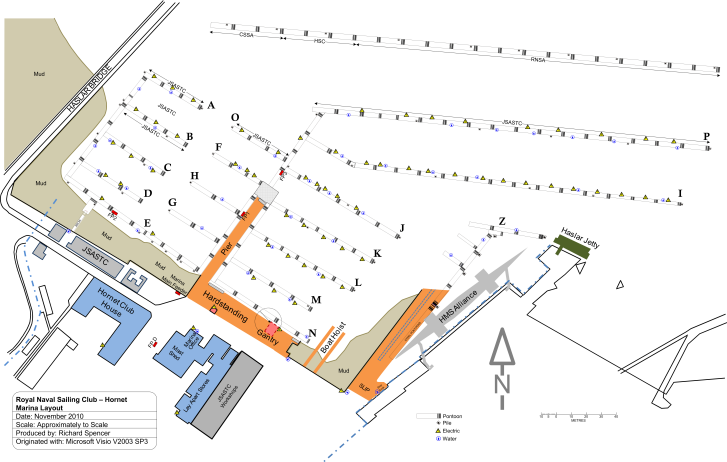 The Marina has a very high level of occupancy and applicants for a berth generally have to join a waiting list. A yacht may be berthed at Hornet only if the owner complies with the Constitution and Rules of Hornet Services Sailing Club. 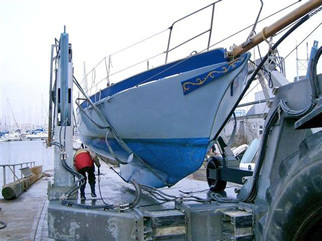 Facilities are available for members to lift masts, and to slip and store yachts ashore for the winter. Short term lift-outs for maintenance are available to members throughout the year. Members who do not have an annual berth may be able to berth alongside in the marina in the winter season, depending on availability. All these facilities are limited and must be booked well in advance with the Marina Manager. Application forms are available in the Members section of this site. All the facilities are invoiced to members at reasonable rates. The Marina is operated by the Marina Manager, Stewart Peters, and two assistants. 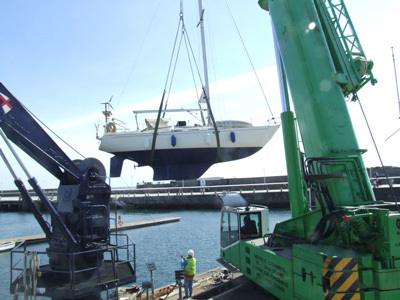 Members are generally required to attend and assist when their yachts are lifted or launched.